A brief history of handmade paper - click on a photo for more information! 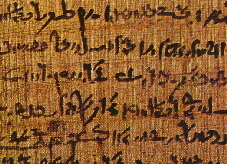 Papyrus is a thick, paper-like material produced from the pith of the papyrus plant Cyperus, which was used for writing in Egypt long before the making of paper in China. Papyrus is made by laminating overlapping layers of plant stem, whilst paper is made from fibres that is completely macerated in water and then re-constituted into a flat sheet on a screen. Parchment is not paper but is made from animal skin, often calfskin, sheepskin or goatskin, and it is used for writing documents or books. Parchment is limed, scraped and dried under tension. It is not tanned and reacts to changes in humidity, reverting to rawhide if too wet. 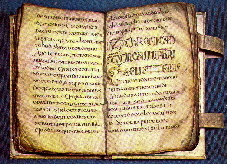 Vellum refers to calfskin. The earliest Egyptian documents written on treated leather go back to the Fourth Dynasty around 2500 BCE. Oldest piece of paper for writing was excavated from a tomb at Fangmatan in Gansu province, China, and dates from the early Western Han (179-41 BCE). 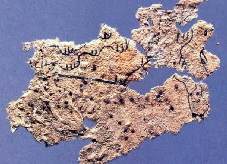 The occupant of the tomb was buried with a paper map laid on his chest, showing mountains, waterways and roads. Read more about the early uses of paper in China. Papermaking is often traced to an official in the Imperial Chinese court called Cai Lun (Tshai Lun or T'sai Lun), during the Han Dynasty and in about 105 AD. 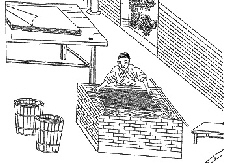 Cai Lun created writing paper using mulberry and other bast fibres along with fishnets, old rags, and hemp waste, but did not invent papermaking. Cai Lun is probably more important for documenting and improving the paper production process so that it could be used on a larger scale. Papermaking was confined to China (and later Japan) until 751 CE, when a Chinese army was defeated by an Arab force at the Battle of Talas, in present day Kyrgyzstan. 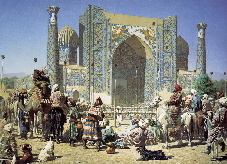 The secret of papermaking was obtained from Chinese prisoners, which led to the first paper mill in the Islamic world being founded in Samarkand in modern day Uzbekistan. A later mill was founded in Baghdad (in 793). Papermaking came to Europe through the Islamic influence in the Iberian Peninsula and the oldest known paper document in Western Europe is the Mozarab Missal of Silos from the 11th century, probably using Islamic handmade paper. The first recorded paper mill in Europe was in Xàtiva, in Spain, in 1151. Due to their noise and smell, papermills were often required by medieval law to be erected outside the city. 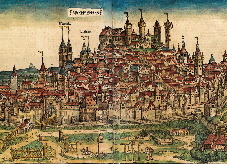 The Nuremberg paper mill is the building complex at the lower right corner of this 1493 painting, outside the city walls. 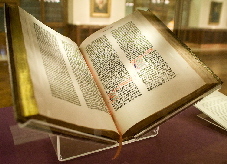 The Gutenberg Bible 42-line Bible was the first major book printed in the West using movable type. The Gutenberg Bible is an edition of the Vulgate, printed by Johannes Gutenberg, in Mainz, in Germany. Gutenberg invented the printing press and was the first European to print with movable and re-usable metal type. The Hollander beater was developed by the Dutch to produce paper pulp from plant fibre faster than the existing stamp mills. It could produce the same quantity of pulp in one day that a stamp mill would take 8 days to prepare. However, the Hollander beater used metal blades and a chopping action to cut the raw material, resulting in shorter cellulose fibres and weaker paper. The stamp mill used wooden paddles and the beating process produced longer, more easily hydrated, cellulose fibres. 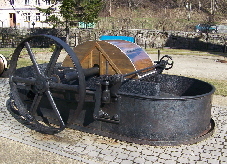 In the late 18th century, an increase in population and the spread of industry, commerce and education increased the demand for paper beyond the capabilities of hand production, thus providing the impetus for the development of mechanised production. 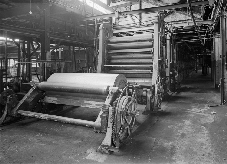 Nicholas Robert patented a continuous paper making machine, which was improved by Sealy and Henry Fourdrinier, and the original Fourdrinier machine was installed at Frogmore, Hertfordshire, in 1803.